Zhaniethia Antoinette Carbonell Villanueva or better known to pageant fans as Zara Carbonell has been appointed as Miss Tourism Worldwide Philippines 2018. She will represent the country in the Miss Tourism Worldwide 2018 scheduled in Bantam, Indonesia’s Pacific Palace Hotel on September 9, 2018. The lovely 25 year-old stunner is the daughter of TV-movie actor Cris Villanueva and former fashion model now businesswoman Zhar Carbonell. 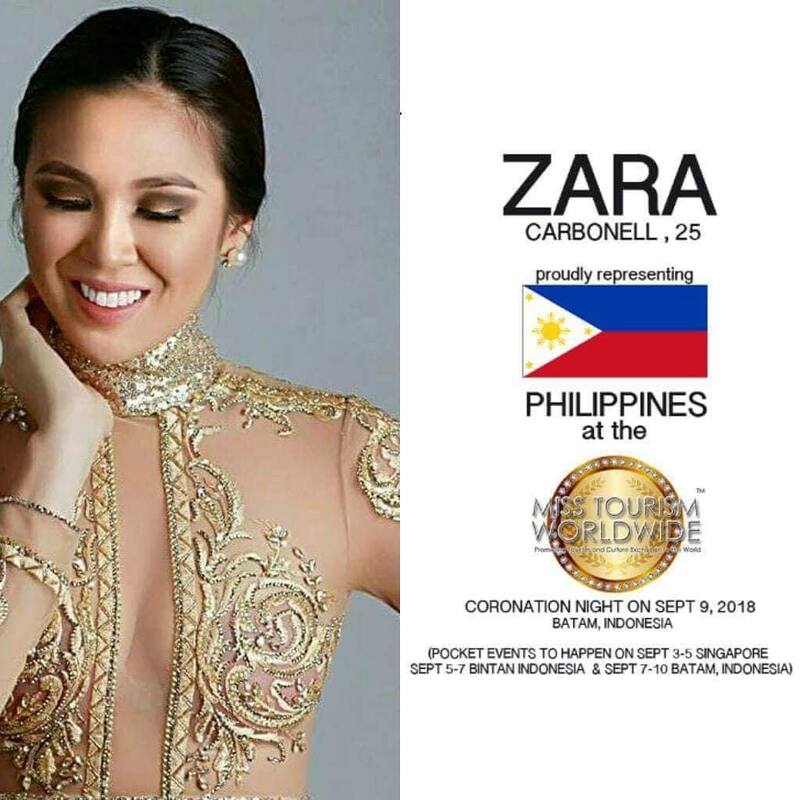 Zara competed at last year’s Miss World Philippines pageant and placed as 2nd princess. “The past year has been a roller coaster of emotional events and I’d be lying if I told you that I saw this coming, but I’m starting to see that every closed door really does lead to something better. Im beyond grateful, for the opportunity, but more so for the people who have stood by my side and those who have really supported and believed in why I do what I do,” said Zara to Life N Style Central. “I’m so thrilled to be able to carry the Philippines’ pride on an international stage and will do my utmost best to make you proud, Philippines!” she added. No doubt, the showbiz world runs in her veins. She appeared in movies, soap operas and even TV commercials. She was a cheerleader for the Red and Gold Booster of Collegio San Agustin during her college days. Approximately 30 hopefuls from different countries worldwide will compete in the said pageant brought by a Singapore-based Lumiere Interntional Organization. We wish you luck Zara! Make the Philippines proud.